You Save: ₹ 1500 (26%). For limited period only. It may end soon. "CSAT notes has perfect data of previous questions and current also, provided graphs and diagrams which are very useful." " The presentation of CSAT notes till date I have ever seen. Hats off to the hardworking team of crackIAS who have made the CSAT easy for us to understand....."
Data Interpretation At the time of Subscription. Basic Numeracy At the time of Subscription. Logical Reasoning & Analytical Abiity At the time of Subscription. Comprehension Skills ,Decision Making And Problem Solving At the time of Subscription. Students living abroad can avail E-notes to avoid extra charges. 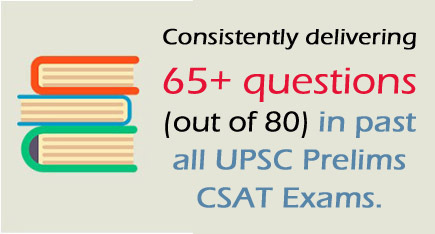 Consistently delivering 65+ questions (out of 80) in past all UPSC Prelims CSAT Exams. For those who do not understand CSAT to those who just need to revise CSAT once - fulfils all your CSAT needs. We have given line-to-line explanation for every concept & question with ample no. of practice questions keeping in mind the requirement for civil services exam. From Concepts to Questions - everything at one place. How many booklets are there in CSAT package? We have 5-Booklets in CSAT package. What comprises in CSAT package? First 4-Booklet of Data Interpretation, Basic Numeracy, Logical Reasoning & Analytical Ability Decision Making, Problem Solving & Comprehension Skills & 1-Booklet of Advanced Level Test Papers. You will get 5 Full length Subject Wise Tests. What is the UPSC Syllabus for CSAT? - Data Interpretation and Basic Numeracy. - Logical Reasoning and Decision making. Do you provide Test series for CSAT? Is it sufficient material to clear CSAT? Yes it is sufficient material to clear CSAT. Don't waste time in the search of books. Spend more time on Practice Questions. I am not from Maths background .So, did you CSAT Notes help me in UPSC Exam? Our notes are designed in such a way even if you are from Non Maths Background, You will start Loving it. We have covered from Basics to Advanced level .Because we have given Line- to - Line Explanation for every concept & question. What is the volume size of your each 5 booklets? The Volume Size of each 5 Booklets is 175 average pages. Can I get the samples of CSAT notes? "CSAT books are simply awesome I am from non mathematical background thes books are designed very simplified manner easy to understand. Thanks for the efforts made on Development of these books." "CSAT notes has a detailed segmentwise breakup to understand basics better and in comprehensive manner." "CSAT notes are simple to understand and easy to remember. While there is no doubt that the books are well prepared meticulously by the unprecedent scholars and experts keeping into mind the UPSC requirement, The vast syllabus, and also aspirants' Time management requirements. The books are useful not only for UPSC exams but also for other competetive and other entrance exams." "I had placed an order for the prelims notes (CSAT) and I am happy I made a wise choice. The notes are really helpful, and considering the fact that I'm in Kerala- far away from the academic ambiance in Delhi- Crack IAS package has proved to be the best companion through my preparation. I am quite happy with the communication and now that I am learning with Crack IAS, I am, to be honest, quite hopeful and thrilled." "Your notes are undoubtedly meticulously researched and written in a comprehensive manner. Availability of all the important facts, data and information at one place helps grasping faster, to some extent." "Aptitude portion (CSAT)covers every major sections of reasoning, English and quantitative aptitude very conceptually and intensively.Excellent work done for Paper - II, given the time constraints." "CSAT notes which in itself is a good initiative taken by Crack IAS Team & shows your commitment for improvement at the highest levels. These notes are best source of quick revision at the last moment as they are presented in point wise form with important terms written in bold." "Crackias CSAT material added value for my preparation and helped me to qualify CSAT. I would like to thank you guys for this." "I hope that the rhythm would continue unhindered and for a longer time. 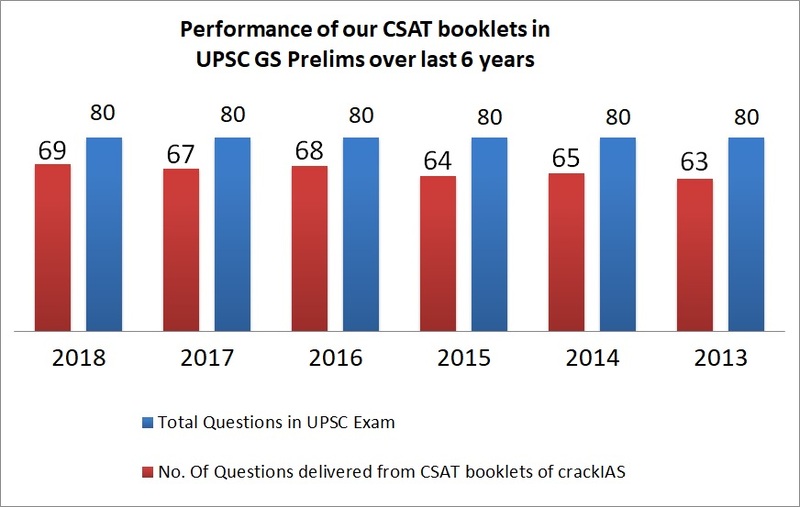 I wish that the line to line explanation provided in CSAT notes would be relevant and important from the UPSC's perspective and the efforts of yours in preparing them and mine in reading them would be fruitful." "CSAT material is matched with the requirement.Line to line explanation helps a lot.Thanks." "It is simple to understand and easy to remember. While there is no doubt that CSAT books are well prepared meticulously by the unprecedent scholars and experts keeping into mind the UPSC requirement, The vast syllabus, and also aspirants' Time management requirements. The books are useful not only for UPSC exams but also for other competetive and other entrance exams. " "I found CSAT notes very interesting as all the material I got at one place.No need to refer for other sources." 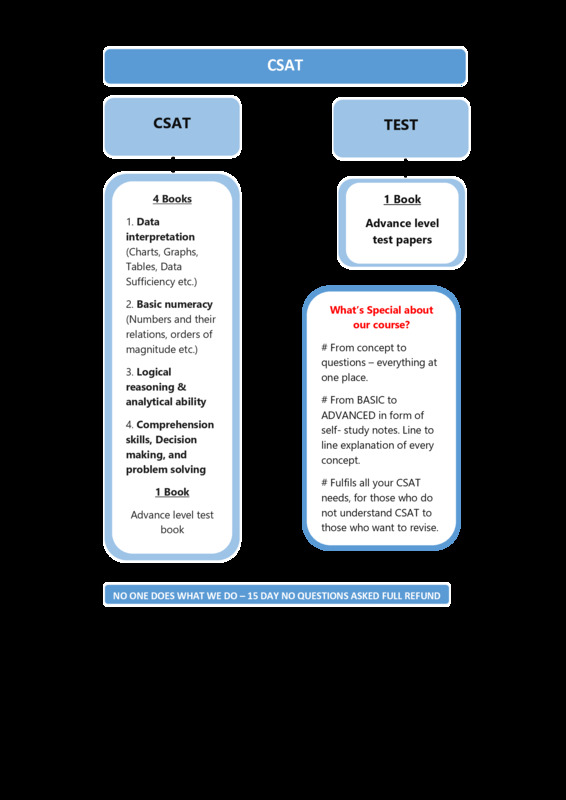 "I found the fantabulous collection of CSAT notes from crackIAS as it was from basic to advance level notes." "Amazing CSAT notes as the last 10 years practice tests questions helped a lot as well as analysis done with them did a great job." "As I am not from the Maths background then also your CSAT notes helped me to qualify the CSAT paper with great marks."